Tonight, they celebrate Anthony Friedkin: The Gay Essay with a tribute to the Cockettes, the theater troupe Friedkin documented in a series of photographs on view in the exhibition. Adele Crawford’s work investigates transience and impermanence. Drawing from an ever-expanding collection of commonplace materials, she explores elements of past and present. Selecting obsolete things, such as photographs from the 1800s, vintage books, or personal papers, she alters their appearance and creates for them a new intention. Process drives her work, which is slow, reflective, and repetitive as she dissects, alters, and reconfigures. 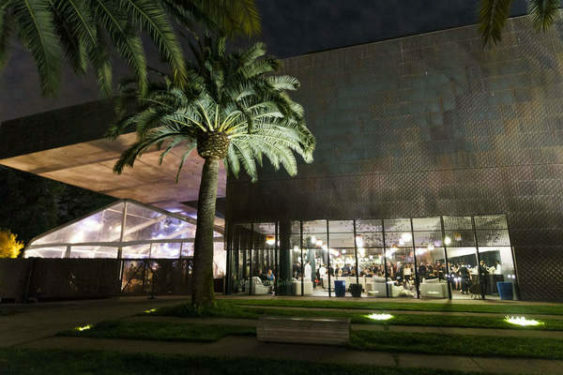 Every week, Friday Nights at the de Young offers art-making activities to encourage everyone, of all ages, to tap into their creativity. Show-stopping numbers first performed by the Cockettes, the theater troupe documented in the early 1970s in photographs on view in Anthony Friedkin: The Gay Essay, are brought to life again. The stars of the Thrillpeddlers, including original members of the Cockettes, recreate scenes from “Pearls over Shanghai,” “Hot Greeks,” “Vice Palace,” and “Tinsel Tarts in a Hot Coma,” which took place in front of the old de Young building many years ago. David Weissman, producer and co-director (with Bill Weber) of the 2002 documentary The Cockettes, will present film clips of the legendary Cockettes, including the 1971 classic, Tricia’s Wedding, along with some other select Cockettes stories and delights.